Have reports that you regularly run, or need to send to your team or the higher-ups? 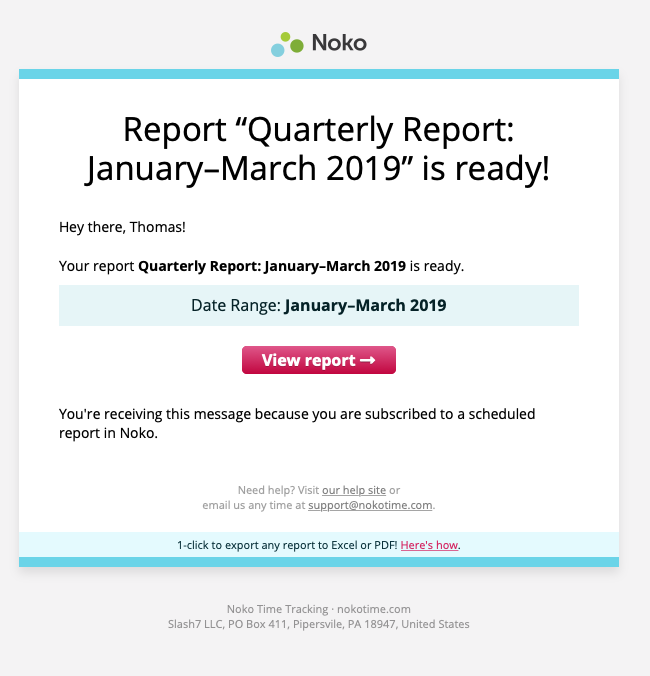 You can have Noko automatically generate and email a report on a regular schedule; perfect for weekly timesheets, quarterly project updates, or executive summaries! You can even send shared reports to external email addresses, a great way to send automated reports to clients! When scheduling a report, you can specify how often to send the report, which people and teams to send a report to, and which external email addresses to send a shared report to. When you are happy with the schedule, click Create/Update Schedule. Note that only Leaders and above can change a report schedule's settings. When you add external email addresses to receive a scheduled report, those email addresses will get a shared (read-only) copy of the generated reports. Anyone with the shared link can view the report and generate a PDF or CSV for the data contained in it without having to use a password. 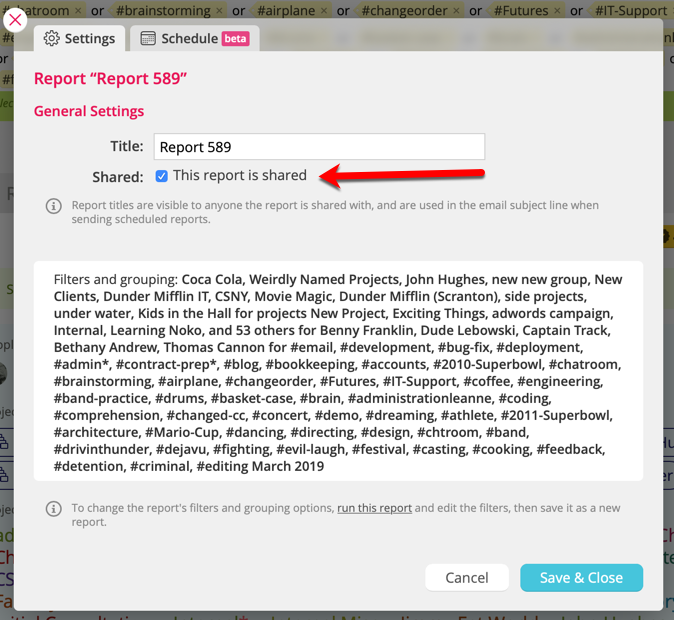 When a scheduled report has been shared, the shared report link from the Reports page will return the report for the current period. This can be useful if you want to give a client an automatically updating report alongside the generated report emails. When viewing a scheduled report, you can click the previous and next arrows next to the report title to view the previous and next periods for a scheduled report. This allows you to quickly compare report periods and export data. Want a preview of what a scheduled report email looks like? Check out the example below! External recipients for a shared report can unsubscribe from a report at any time by clicking the "Unsubscribe from this report" link at the bottom of the email. 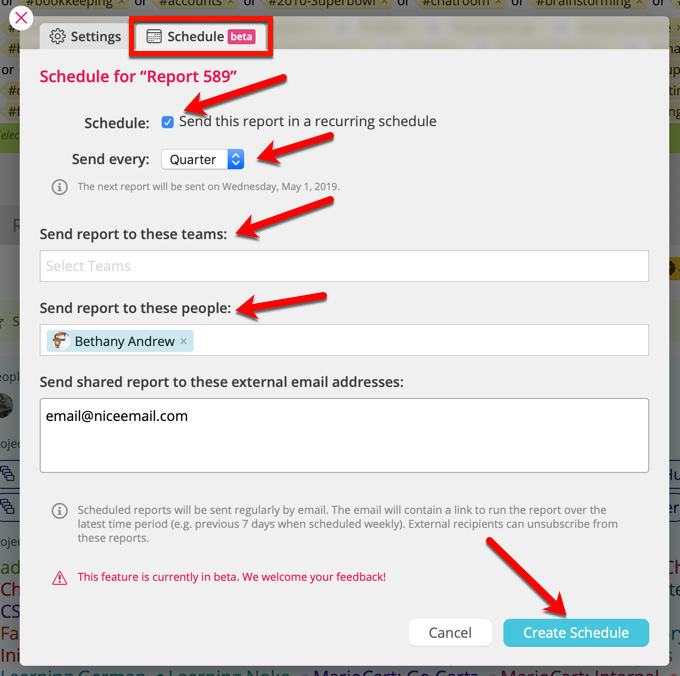 If you're a user in Noko, or part of a team that has been subscribed to a scheduled report, you or your team will have to be removed from within the report settings. Note that only Leaders and above can change a report schedule's settings.